Last week we told the story of the first passenger train to run on the Wellingborough  Higham Ferrers branch line sixty years ago. Now this rare photograph has come to light. It was lent to us by Mr. Reginald Cave, of Rushden  then the small boy seen halfway along the right-hand seat. In a saloon carriage of the first train are seen the dignitaries of Higham Ferrers, who were guests of the railway and evidently had a coach to themselves. The nearest figure on the left is Dr. John Crew. It has not been possible to identify all the others, but the Mayor of that time (Ald. W. Spong) and other members of the Corporation have been recognised. When the train stopped at Rushden the station approach was packed with high-spirited crowds and people clustered on every point of vantage near the track. 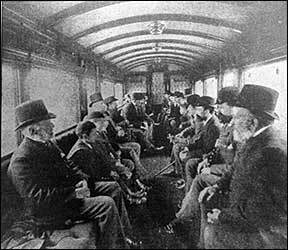 The many passengers who joined the train at Rushden included members of the Local Board and other prominent townspeople. They moved off to a great burst of cheering, and on the train’s arrival at Wellingborough an official reception was held. Mr. Henry Pitt was the Rushden stationmaster. He must have had a busy day, for the trains were packed with joy-riding crowds and excitement continued until a late hour. The fare from Rushden to Wellingborough was fourpence. Children could ride between Rushden and Higham for a halfpenny, and hundreds of them snapped up the chance to enjoy their first train ride. In luxurious contrast to this “puffing Billy” which was the first train to run on the Wellingborough  Higham Ferrers line when it opened sixty years ago, a modern lightweight diesel-powered train is to operate experimentally on the route from next Monday. The new train will have three coaches and a seating capacity of 117. More comfortable seating, better views of the landscape, and smoother stopping and starting are its notable features. 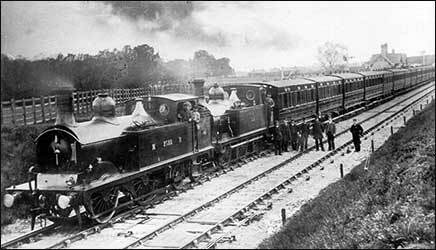 The above picture, taken on May 1st, 1894, was sent in by Mrs. G. Windsor, 144, Mill Road, Wellingborough, the wife of a retired railwayman, and daughter of the driver of the leading engine, Mr. Fred Seal. Mr. Seal is seen here with his fireman, Mr. Sam James, also of Wellingborough. In the second engine are Mr. Alfred Glover, driver, and Mr. George Bollard, fireman.